Indigenous people find it far more difficult to enjoy their fundamental human rights than mainstream groups, as their traditional laws, values and customs have been eroded by the influence, and rapid development of mainstream culture. These issues have been further exacerbated by a lack of government recognition and specific legal mechanisms to protect against such discrimination. We have been implementing the Support to Indigenous Peoples in Plain Land (SIPPL) project since 2011 with financial and technical support from Oxfam. The main objectives of this project are to empower the indigenous population through capacity building, and to enhance local Community Based Organizations (CBOs) to better enable indigenous people in recognizing their rights and claiming their entitlements from government and different service providers. Under Anagrasar Gonno Unnayan Prokolpo (AGUP), we organized consultative meetings with local government institutions on indigenous people;s issues. The aim of the meetings was to encourage indigenous people to share their problems with local government officials and to introduce them with local government offices, and their duties and responsibilities. The rationale behind these meetings was to bridge the gap between indigenous people and local government. We realize that local government play an important role in the lives of indigenous people, and the indigenous population, though have the right to report their issues to upazila administration, are not in the habit of doing so. The meetings are therefore a platform where they can raise their concerns and offer an opportunity for upazila administration to better understand the challenges that indigenous people face. 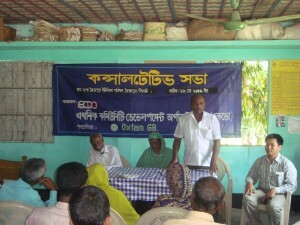 In 2013, ECDO set precedence by organizing the first public hearing on indigenous human rights violations which was held in Sylhet City under Strengthening the voice of human rights defenders to protect right and entitlements of ethnic minorities project with support from European Union and Oxfam. ECDO also formed a Human Rights Defender (HRD) forum in Sylhet to protect human rights for indigenous peoples and other marginalized groups. This forum is consists of twenty five members including male and female and these members have selected from different sectors like academician, lawyers, civil society members, students etc. ECDO already provided training to these HRD forum members and now they are working very actively on indigenous peoples rights issue. All of our projects and activities that relate to human rights are supported by Civil Society Organizations, including political leaders, media, academics, local government officials, and indigenous leaders.